Enjoy a spectacular day on the water on board a catamaran sail boat from Cancun. Snorkel on a wonderful Caribbean reef then go to the island of Isla Mujeres to explore, have lunch, shop...then try out the spinnaker on the way home. This tour has it all! Great fun for a day on the water and on the beach for the whole family! Read Trina's Trip Report on the Catamaran to Isla Mujeres. $13 USD Sea Life Conservation / Dock Fee must be paid at boarding. Check in at marina by 9:30am, at Samba Catamarans Marina Albatros, located at KM 3.5 at Cancun Bay Resort Cancun Hotel Zone. 1 hour free time on the island for shopping / exploring the island. Beach club where you can pet a shark, relax on the beach in hammocks & lounge chairs or swim in the ocean. 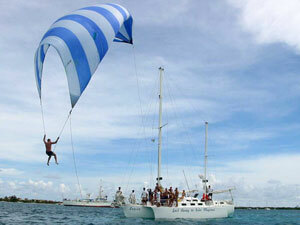 On the way back to Cancun we'll anchor and everyone can try the spinnaker (weather permitting). Open bar also included. If you are staying in the Riviera Maya, we can add on round trip transportation. Just email us for a quote. Pack for this tour: Sunscreen & SFP lip balm, sun glasses, swimsuit, towel, walking clothes on Isla Mujeres, camera and a hat.